It seems to make more sense to distribute my recent works digitally rather than on fixed media. Therefore, few of my recent works appear on physical recordings, and even older works are not well represented (at all) on SD DVD, given the limitations of that medium. Please don't hesitate to contact me if you are interested in digital, full-definition copies of any of my works. Phase 3 | Video.kunst.zeit. Volume 3. Br-Alpha / Bayerischer Rundfunk. 2010. Tenderflix 2010 Experimental DVD (limited edition), Tenderpixel Gallery, London. 2010. Critical Mass: Kinetica/Hypnos. Threshold Studios. 2010. The Best of Punto y Raya Festival 2007. 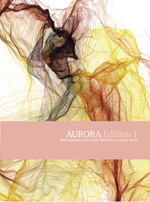 AURORA Edition 1. Aurora Festival. 2008. ACM SIGGRAPH Video Review 2006, Issue 154, "Animation Theater Program Part I". 2006. Not Still Art International Screening Video 2001. Improvising Artists Incorporated. 2001. One Iota – Iota Center Members’ Compilation Video. Iota Center. 2000. Flute Meets Machine: Music for Flute and Electronics, Sarah Bassingthwaighte, Pandora Records. 2006. Computer Music from the University of Washington. Consortium to Distribute Computer Music / Centaur Records. CRC 2512. 2001. Intrada. Present Sounds Records PS0401. 2004. Spike and Mike’s Festival of Classic Animation 1999. Diane Thome: Bright Air/Brilliant Fire. Consortium to Distribute Computer Music / Centaur Records. CRC 2527. 2001.